Faith and Work: Multi-faith Workplaces – Healthy or Hazardous? Makkah Masjid, 36 Thornville Road, Leeds, LS6 1JY. An interactive evening with food and lots of opportunity for conversation and discussion. How do multifaith workplaces function? What’s great about multi-faith working and what’s not? What can we, as people of faith, bring distinctively to multi-faith workplaces? Makkah Masjid Mosque welcome people of all faiths to join in this event of hospitality and conversation. Start by sharing food with our wide range of participants and begin the conversation. 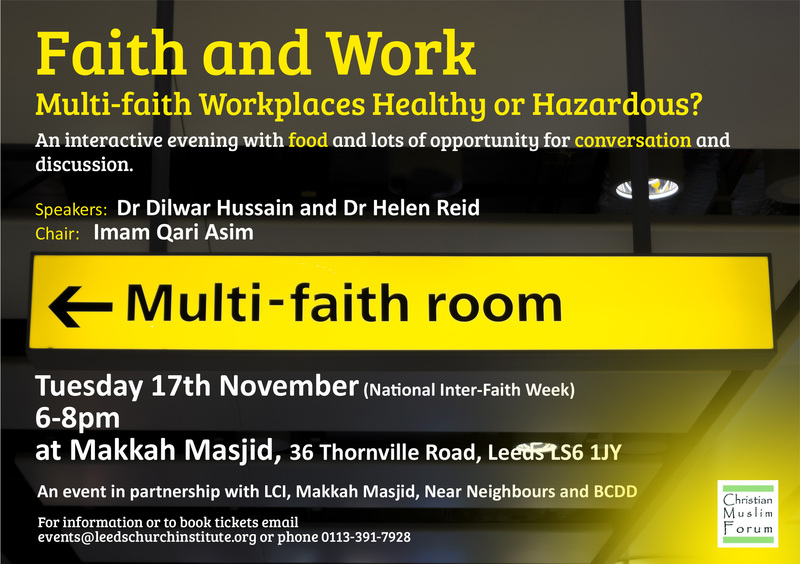 Then hear key note speakers Dr Dilwar Hussein and Dr Helen Reid speak about the delights and challenges of multi-faith workplaces, chaired by Imam Qari Asim. There will then be space to explore the issue further through conversation with the speakers and each other. Food provided will be vegetarian and halal. All guests will be required to remove their shoes on entering the mosque. Dilwar Hussain is Chair of New Horizons in British Islam, a charity that works for reform in Muslim thought and practice and blogs at: http://www.dilwar.org. He is a Research Fellow at the Centre for Trust, Peace and Social Relations, University of Coventry; Visiting Fellow in Contemporary Islam, Centre for Society, Religion & Belief, University of Derby; Research Associate of the Centre of Islamic Studies, Cambridge University; Research Fellow at the Lokahi Foundation and Senior Programme Advisor to the Institute for Strategic Dialogue. His research interests include: social policy, Muslim identity and Islamic reform in the modern world. Dilwar is a Trustee of the Three Faiths Forum (3FF) and the Holocaust Memorial Day Trust and a member of the Faiths Advisory Panel for Near Neighbours. He was Head of the Policy Research Centre, at the Islamic Foundation (2007-2013), a Commissioner at the Commission for Racial Equality (CRE) (2006-2007), a Trustee of Maslaha (2011-2013), and served on the Archbishop of Canterbury¹s Commission on Urban Life and Faith (2005-2006). Helen is Director of Leeds Church Institute, a charity with a small staff team, growing membership and a trustee board, an educational remit and a conferencing business. LCI is based in Leeds city centre, but also works in locations across the city such as schools, universities, churches and local communities. Previously Helen was Director of Bradford Churches for Dialogue and Diversity, engaged in education and action for better understanding between different faiths. Helen left this post after seven years to take up the opportunity with LCI and is pleased to be working in the city where she has lived for many years. Helen was awarded a PhD in Peace Studies (1997) for research into the role of conflict resolution in Religious Education in schools in Bradford and Leicester. This was a formative time in her career and she continues to be motivated by a commitment to acting with others for the city to be a better place for all. After completing post-doctoral research, she chose to leave an academic career track so that her work life was faith and community based. However, research and learning are central to her approach, and she maintains active links with the University of Leeds and Leeds Trinity University. Qari Asim is a real estate solicitor by profession, working at DLA Piper UK LLP, one of the largest legal firms in the world. He deals with legal issues relating to commercial property and the construction of skyscrapers in Leeds, which are visible signs of the city’s booming economy. In the evening he deals with invisible improvements, assisting in spiritually uplifting the Muslim community. Qari Asim is also currently a senior Imam (prayer leader) at Leeds Makkah Mosque, which is UK’s Model Mosque. The mosque won the nationwide award due to its outreach work, and for planning initiatives that actively engage with youth, women and different community organisations. Qari Asim is an Executive member of the Mosques and Imams National Advisory Board and provides guidance to mosques and Imams in the North of England. He has also advised local statutory bodies and law enforcement agencies in respect of Islamic and cultural issues. Qari is also Chair of Deen Foundation, an organisation dedicated to promoting education. He has translated a number of articles from Urdu to English and has authored a book Our Children: Our Future. Qari’s current focus is on youth engagement; he is co-founder of Young Minds, a voluntary community organisation committed to providing recreational and educational activities to the youth. Wahida Shaffi is the Coordinator for the Near Neighbours Programme in West Yorkshire. She is also overseeing the development of six Catalyst Leadership Programmes in the North of England and the Midlands. She holds the position of National Women’s Programme Lead with the Christian Muslim Forum where she has pioneered their national women’s programme conducting research exploring the issues affecting women of faith across the UK amongst other events. She has over 20 years experience of working with diverse and disadvantaged communities. She completed her MA in international politics and security studies at the Department of Peace Studies at the University of Bradford. Since then she has gone on to facilitate, deliver training, complete research and produce films on a wide range of issues related to equality, diversity, participation, gender, conflict and interfaith both locally, nationally and internationally including Sri-Lanka, Israel, Palestine, Syria, Turkey, Romania. She is a qualified Social Worker, Assessor and Trainer (an associate of the Chartered Institute of Personnel and Development) and author of a book published by Policy press titled Our Stories Our Lives: Inspiring Muslim Women’s Voices. Her current areas of interest are contextual theology, participatory research, reconciliatory dialogue, and supporting and advising women and multi-faith groups across the country.